Teotihuacan is an ancient site located 50 km northeast of Mexico City. 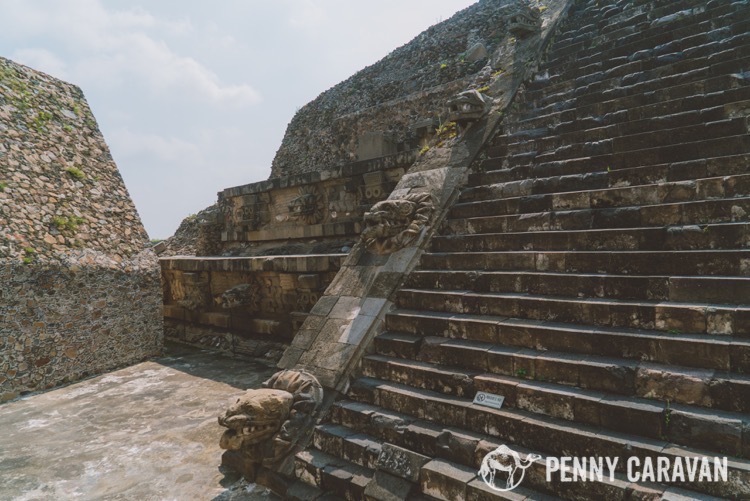 It was founded in the 1st century AD and remains one of the most important architectural sites of pre-Columbian Mesoamerica. Its structures are spread along the 2km main avenue, the Calzada de los Muertos (Avenue of the Dead). 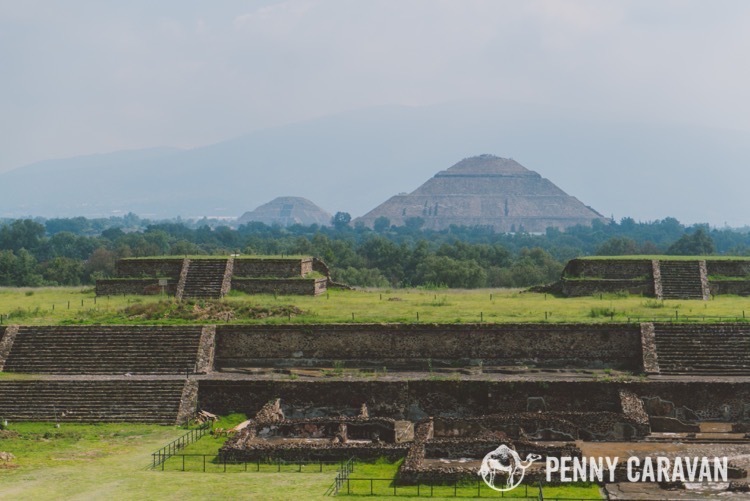 This site is famous for its pyramids as well as its multi-level residential complexes. 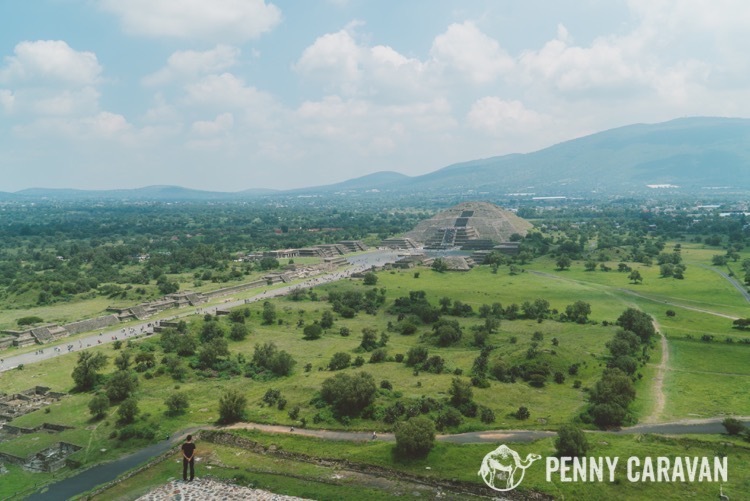 With the site being so far from Mexico City, you may be tempted to take a taxi or hire a driver, but with the distance that can get quite pricy. And if you’re like us, you can’t stand spending a good chunk of change on a group tour, stopping at every souvenir stand and waiting for people to finish their ice cream while you’re itching to climb the next pyramid. 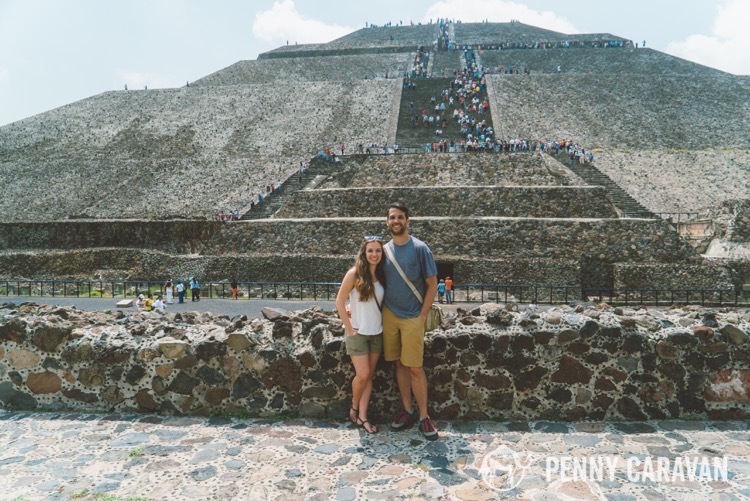 The good news is it’s cheap and easy to get to Teotihuacan on your own! Don’t be intimidated by the metro and buses—we found that they were quite easy to navigate. 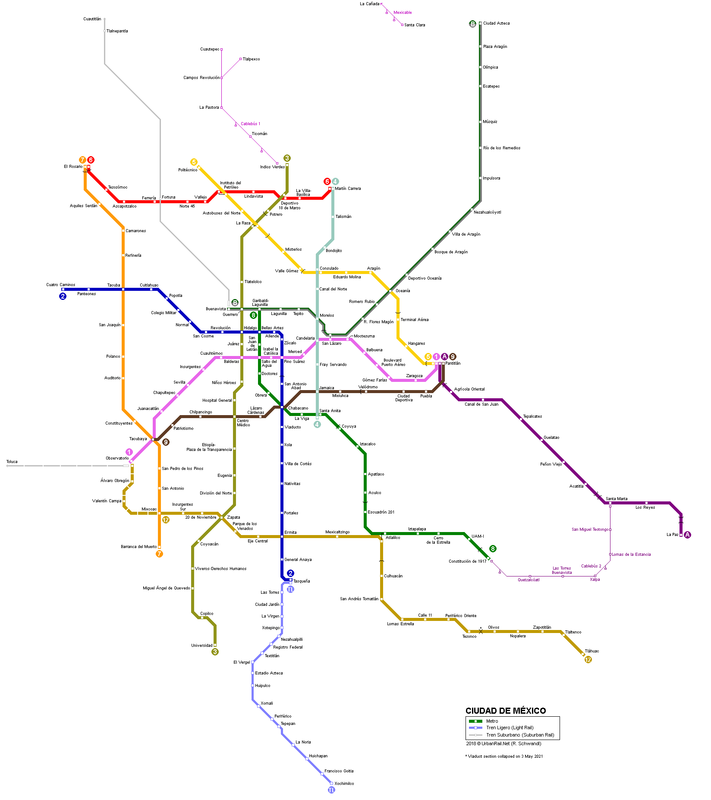 I would recommend you print out this metro map to take with you, and copy and paste the directions below into a Google doc. Then if you download the Google Drive app, you can access your files without internet! Shane and I at the Pyramid of the Sun. Take the metro to the Autobuses del Norte Station (line 5 – yellow). Metro tickets are $5 pesos per trip (about $0.33). You can’t miss the bus station, it’s right across the street from the metro exit. At the main entrance of the bus station, take a left and go all the way to the end of the terminal. Look for the Autobuses Teotihuacan ticket counter, which has a blue pyramid icon. Ask for “Piramides” and you will get a round trip ticket for $80 Pesos (about $6 USD). After you get your ticket, follow the signs for “Andenes” (platforms). Buses depart every 15 minutes from platform 7 or 8. If in doubt, ask someone who looks like they know what they’re doing! This bus does make other stops, and took about an hour total to get to the site. 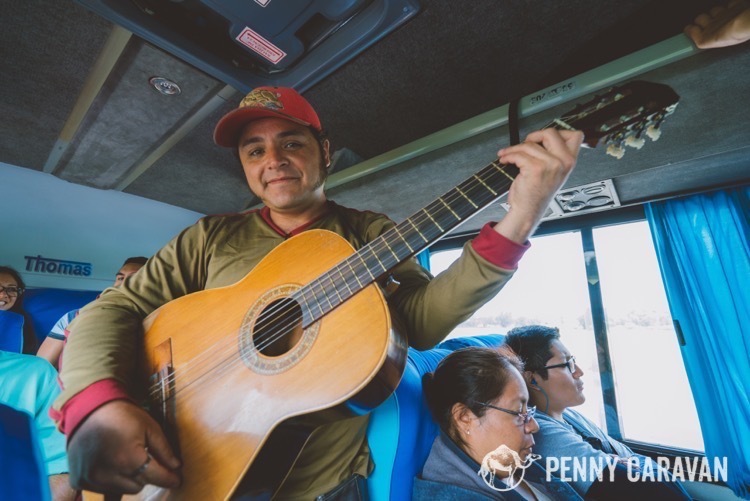 We could have gone with a tour group to Teotihuacán, but then we would have missed this bus musician! 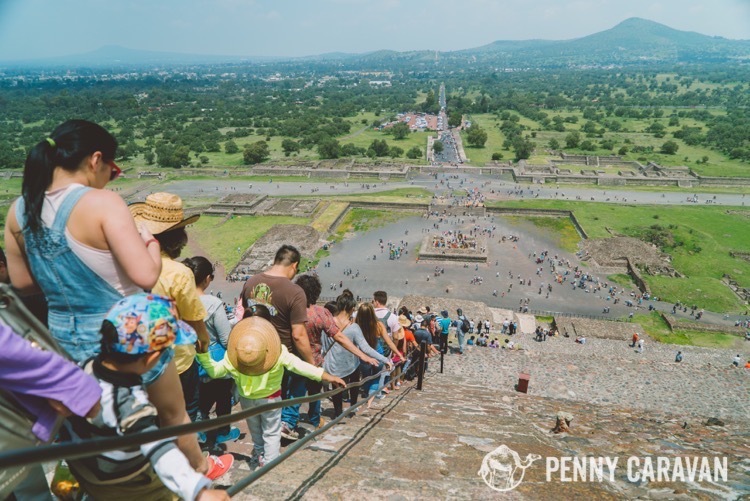 You will not have trouble knowing where to get off—the driver will yell “Teotihuacán”, and nearly everyone else will be getting off there as well. You will be dropped off at the main road entrance to the site, which is Gate 1. The first temple, Temple of the Feathered Serpent, just across from the entrance gates. Looking down to the other pyramids from the Temple of the Feathered Serpent. This is how far you have to walk to see the whole site! You will have to walk the entire length of the Avenue of the Dead to see the whole site, so wear your walking shoes and be prepared to spend most of the day here. You can find food vendors around the gates, but it’s quite a hike between them, so make sure to take water with you. Restaurants can be found outside the exit gates. The Avenue of the Dead. On top of the Pyramid of the Sun, looking at the Pyramid of the Moon. 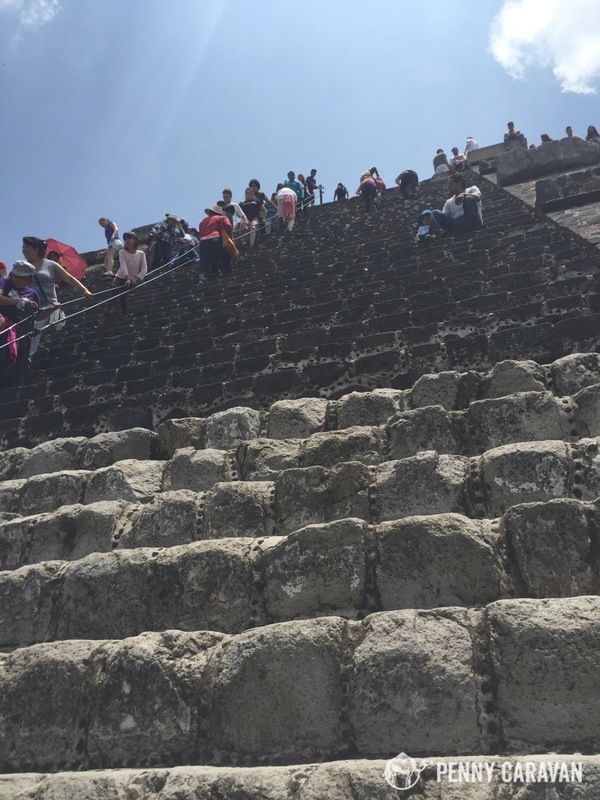 Walking down the Pyramid of the Sun—as you can see, it gets very crowded! 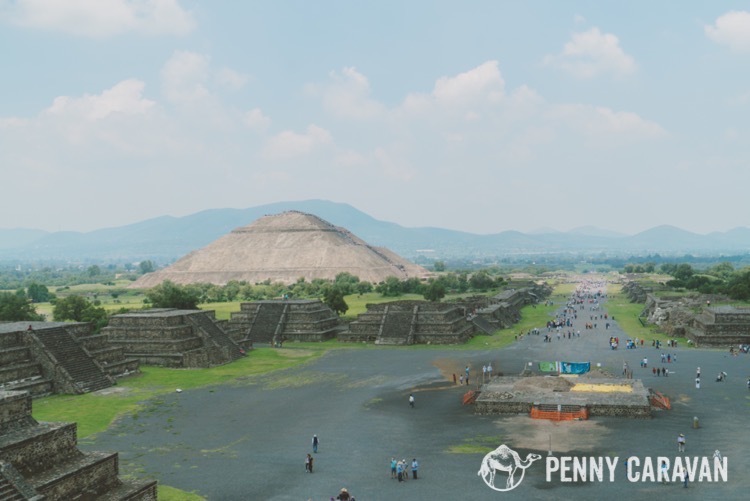 Something I find especially interesting about the site is that the Pyramid of the Sun has the same base perimeter of the Great Pyramid at Giza, and the distance ratio of the pyramids is exactly the same as those at Giza. On top of the Pyramid of the Moon, looking back at the Pyramid of the Sun. 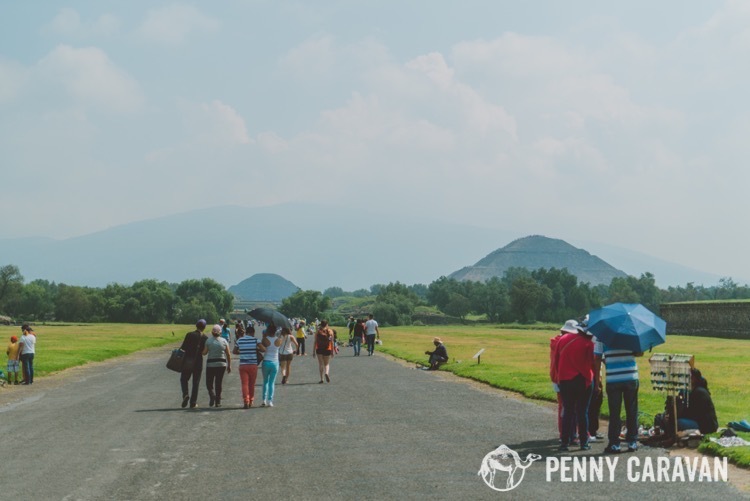 When you leave Teotihuacán, you will be leaving out of Gate 2 or 3, and there will be no signage to help you determine where to wait for the bus. You may see buses stopping across the street, kind of catty-corner from the exit gate. Wait here and look for the bus that says “Central del NTE”. Of course, if in doubt, you can always ask someone. Show them your ticket and they will be happy to show you where to wait. Our total cost for this day was $20/per person which included lunch at one of the restaurants outside the gates. With the price of a group tour or private driver being upwards of $90/per person, I think it’s safe to say it is worth the “trouble” to go on your own! Part of the experience of being in a new place is navigating the area, forcing yourself to use what little language skills you have to talk to locals, etc. So get out there and have fun! Great to read the above, I had researched the trip and wanted to do it that way and you’ve reassured me that it’s the best way to go.